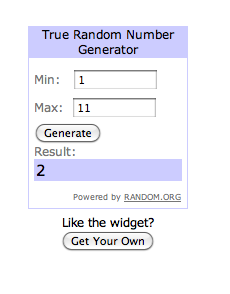 Using random.org (see pic below) the winner of The Haunting of Charles Dickens is comment #2, the Dewey Review! Congratulations! If you don't hear from me, please e-mail me your snail mail address. I hope you enjoy the book and I look forward to reading your review!